Theoretically, Quicken 2012 passwords let you lock up your Quicken data so that your rebellious teenagers (if you’re using Quicken at home) or the night janitors (if you’re using Quicken in a business) can’t come in and print checks, process automatic payments, and just generally mess things up. Before you set up a password and then start relying on it to protect your information, a Quicken password only prevents someone from accessing your data with Quicken. Using a password doesn’t prevent someone from fooling around with your computer itself. If the night janitors — or, heaven forbid, your teenagers — are the nefarious types, they can erase your files with Windows or scramble them with another program, such as a spreadsheet or word-processing program. And they may even be able to get in and manipulate the data with another checkbook or accounting program. Select the file you want to protect with a password. If the file you want to password-protect is not the active file, choose File→Open on the menu and then either double-click the file you want or select it and click OK. Choose File→Set Passwords For This Data File on the menu bar. 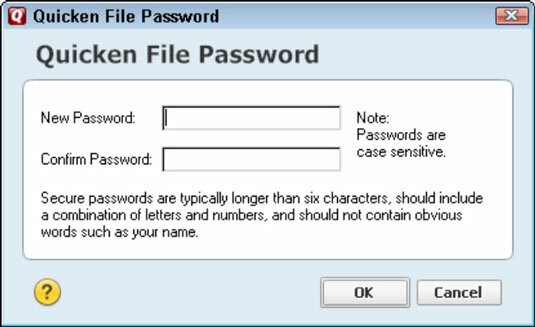 Quicken displays the Quicken File Password dialog box. Enter the password into the New Password text box. Enter the password you want to use again — only this time into the Confirm Password text box — and then click OK.
Assigning a password to a file doesn’t prevent you from doing anything with the file that you would normally do. However, the next time you try to use this file — after you start Quicken or when you try to select the file by using the File→Open command — Quicken will ask you for the file’s password. You need to supply the password to gain access to the file.